Picture courtesy of Niagara Falls Public Library/Local History Dept. Poor Maud. She made it through the Class 6 deadly Whirlpool rapids in Carlisle Graham's barrel, but got stuck going around the Whirlpool, for HOURS! This article from the New York Press barely mentions it, but the folklore is that she took her dog with her and the dog stuck his nose out the air hole to breath blocking Maude's air. Well, the dog didn't help Maude any. Thanks to Dan Davis for finding the story. When Taken out of the Barrel the Woman Was Dead—Graham Safely Swims Lowe Rapids. Niagara Falls, NY, Sept, 7-- Maud Willard, a variety actress, born in Canton, Ohio in 1876 met her death here this evening in an attempt to navigate the whirlpool rapids in Carlisle D Graham’s barrel. 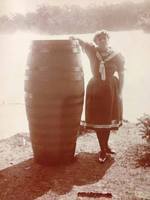 She was a prisoner in the barrel for six hours, floating and being tossed about the whirlpool. She started on the trip a 4:05 o’clock this afternoon, and the oak cask could not be gotten out until 10 o’clock tonight. It was caught at the whirlpool on the Canadian side, and when the cover was taken off the woman was dead, having suffocated. The affair was advertised as a dual trip, the Willard woman going through from the beginning of the rapids in the barrel which has carried Graham safely through the same treacherous currents five times before, the last time on July 14 of this year. The second attraction was to be Graham’s swim from the Whirlpool down through the lower rapids to Lewiston. The latter part of the programme was carried out, but the woman who staked her life, lost. 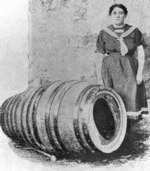 Miss Willard entered the barrel and the cover was closed tightly. The only ingress of air was through a hole no larger round than a cigar, but she could live and hour or so inside. After drifting about in an eddy for a quarter of an hour a current took the barrel down through the terrible breakers safely. At 4:45 the barrel rounded into whirlpool and Graham, who stood on the American shore, plunged in for his part of the performance. He wore a heavy cork life preserver about his body and an inflated collar around his neck. He braved the treacherous lower rapids and reached Lewiston, four miles below, at 5:10. He was picked up by a row boat and landed at Pitz’s Hotel dock safely. The Willard woman was not so fortunate. The barrel was caught up a swirling current of the whirlpool and carried around swiftly, knocking against driftwood and being tossed around like a cork. The crowds on the bank eagerly watched the cask as it was carried around time and time again, each time too far from shore to be reached by the strong swimmers who were waiting on the bank. Maud's marker. (Courtesy Joel Paradise)Maude is buried right off of the road on the far right as you enter the cemetery.